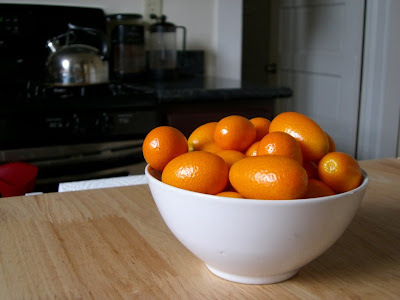 What To Do With Kumquats? I have a really bad habit of buying bananas, not finishing them and refusing to throw them out when they go all spotty and brown. Kid Cayenne could strangle me. It's just that I always think I'll bake something with them. A brown banana is a perfect banana when it comes to quick breads and muffins and all sorts of wonderful things. Trouble is, I don't get around to it and a week later, when the kitchen is swarming with tiny fruit flies that keep smacking into our faces and I can't deny it any longer, they finally get tossed. This is a frequently repeated cycle in my house. Not this time! Pim, of Chez Pim, recently adapted a banana bread recipe that has been out in food blog land for a few years via Smitten Kitchen and Simply Recipes. She wanted to jack up the interest level on the already good recipe by adding a shot of espresso and a glug of whiskey. I thought that was an excellent idea. I've already had great success with adding espresso to the chocolate muffins, cupcakes and brownies I used to bake for a little coffee house in the French Quarter many years ago. It adds an extra intensity to the chocolate, makes it more than it was before, makes the chocolate sing. What could it do to banana bread? I wanted to find out. Presumably, Pim calls it Morning After Banana Bread because it also contains the hair of the dog... in her case, a shot of Jameson whiskey. I used New Orleans rum instead because I had it in the house whereas Jameson, I do not. 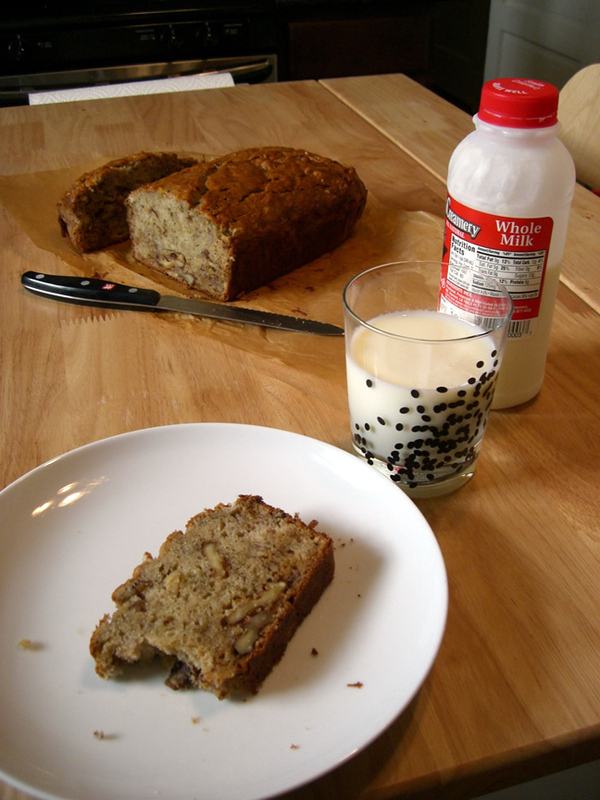 I also added a cup of walnut pieces and halves because the idea of a banana bread without walnuts makes me really sad. Other than that, the recipe is identical to hers. 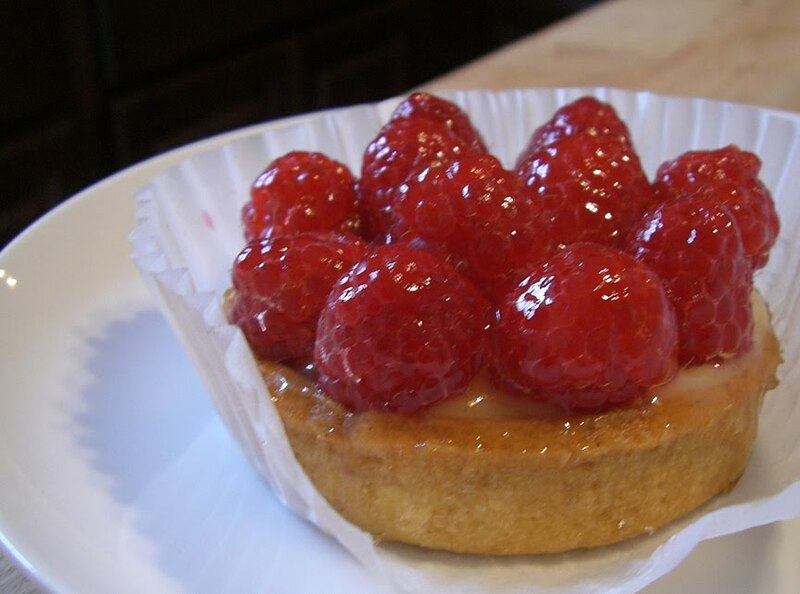 I will list my version here, but you should really visit Chez Pim's recipe page if you'd like to see her very nice photos of the process. The result? It's wonderful. Fragrant and buttery and richly flavored. The espresso and rum don't stand out as individual elements, but you do get a sense of them being there. I've already had 3 slices today. My belly fat roll is expanding visibly but I can't help myself. Try it and see if you can. In a large mixing bowl, mash the ripe bananas until creamy. Add the egg and yogurt and whisk to blend. Next add the melted butter, espresso and rum. Mix in. Add the sugar, baking soda and salt and stir to completely incorporate. Sift the flour into the bowl and stir with spoon (gently and slowly) until you can no longer see white spots of flour. Add walnuts and lightly fold into the batter. Butter and flour a 9” loaf pan or line it with a piece of parchment. Pour the batter into the mold and then shake it or knock it lightly on the counter to remove air pockets and get the batter to settle. Bake on a cookie sheet for 1 hour or until a toothpick or wooden skewer comes out clean. I had never even heard of chicken spaghetti until I moved to Louisiana. I was skeptical about whether I'd like it. My mother in law's version convinced me I had really been missing out. Now, when I make it, I adapt her recipe. Her cooking specialty is long, slow simmered dishes that take hours and you can really taste the impact that has on her sauce. I don't usually plan far enough ahead and am starving at 7pm with no meal in sight, so I make this much quicker version. I take shortcuts. 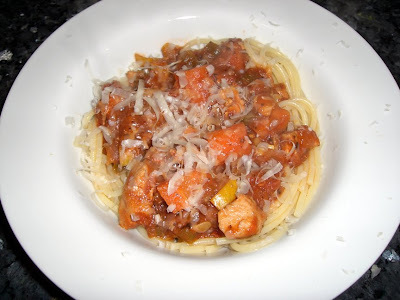 Sometimes, I use jarred pasta sauce instead of making my own. Sometimes, I don't use the right wine. Today is one of those days. I'm not saying it's perfect pasta sauce, just saying it's really good and really easy. The carrot and squash create a subtle sweetness that tones down the acidity of the tomato sauce and create a bit of depth. You'll like it. Cut boneless skinless chicken breast into bite sized pieces and season with salt and pepper. Bring 1 TB olive oil to shimmering point in a 5 quart or larger dutch oven or heavy, covered skillet over medium high heat. Lightly brown chicken. You can choose to use chicken thighs, the shredded meat of a rotisserie chicken or a whole chicken in 8-10 parts if you prefer. Just adjust the cooking times accordingly. Add diced onion, bell pepper and garlic. 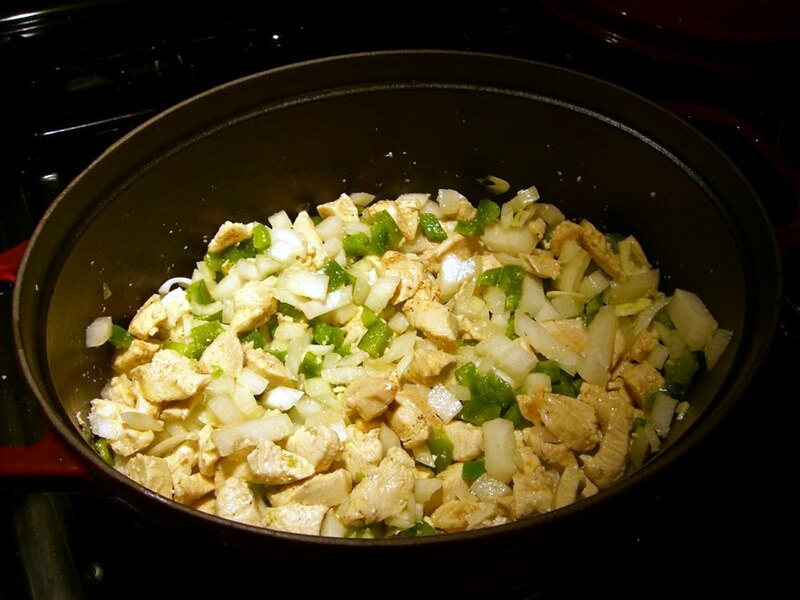 Saute with chicken until the they begin to soften and onion is becoming translucent. Add carrots. Don't stir too much. Let the vegetables have contact with the pan long enough to get a bit of golden caramelization. Sauté for 3-4 minutes. 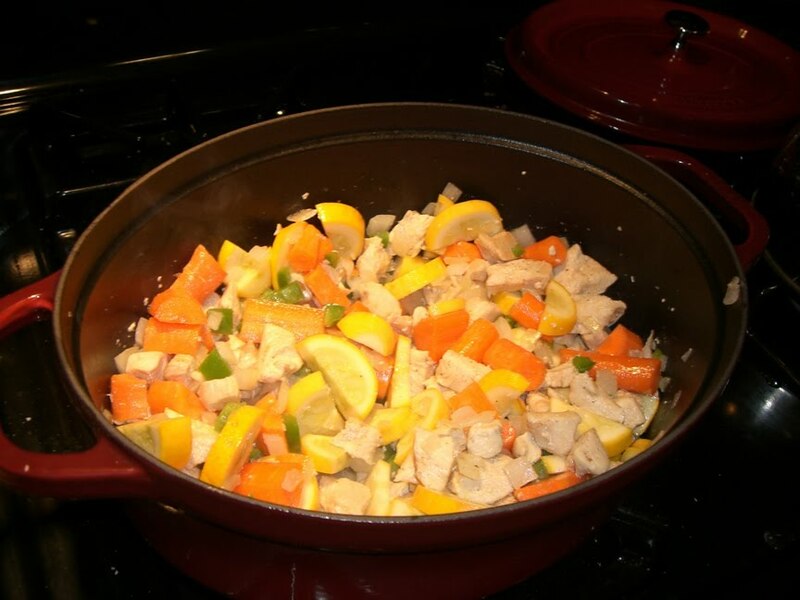 Add yellow squash and sauté about 1 minute longer. Vegetables should be softening but not cooked through at this point. 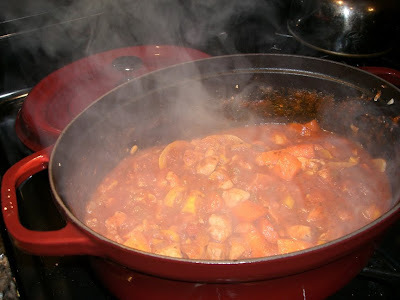 Add wine to deglaze pan. 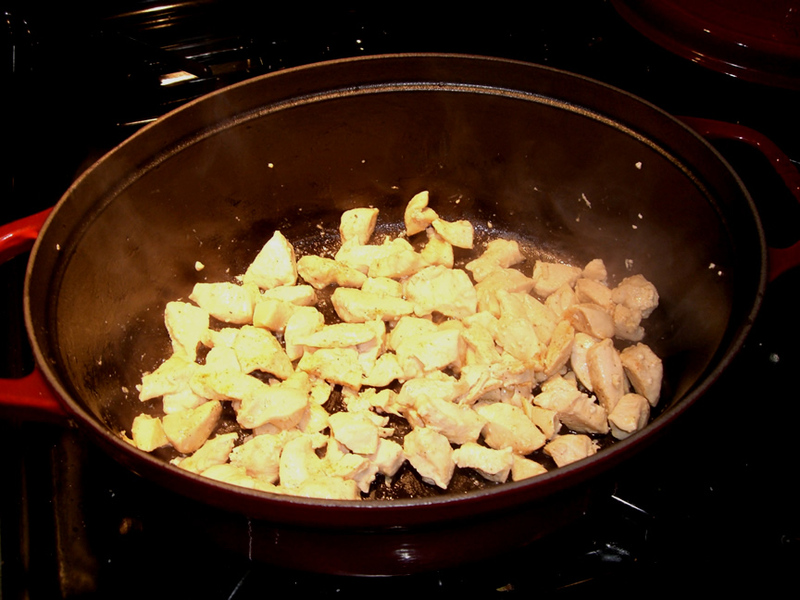 Stir briefly to loosen any nice golden bits from the bottom of the pan. If you don't get any golden bits (I didn't last night) it's OK. It just means that the pan may have been too crowded and the vegetables steamed a bit more than they caramelized. It happens. 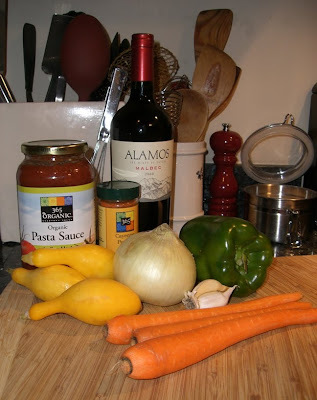 Add jar of pasta sauce. Add cayenne pepper and any additional seasoning to taste. Cover and simmer on very low heat for 20 minutes to 3-4 hours, depending on how hungry you are. Longer is nice, but not essential. Cook pasta separately according to package instructions. Serve sauce over pasta with lots of freshly grated Parmesan Reggiano. Empty the tuna, oil and all, into a bowl. You can drain it and use your own olive oil as a dressing instead, but I find that the oil it is packed in is of decent enough quality that I don't have to. Sometimes, I will drizzle a little of my good olive oil over the finished product if I really want it. 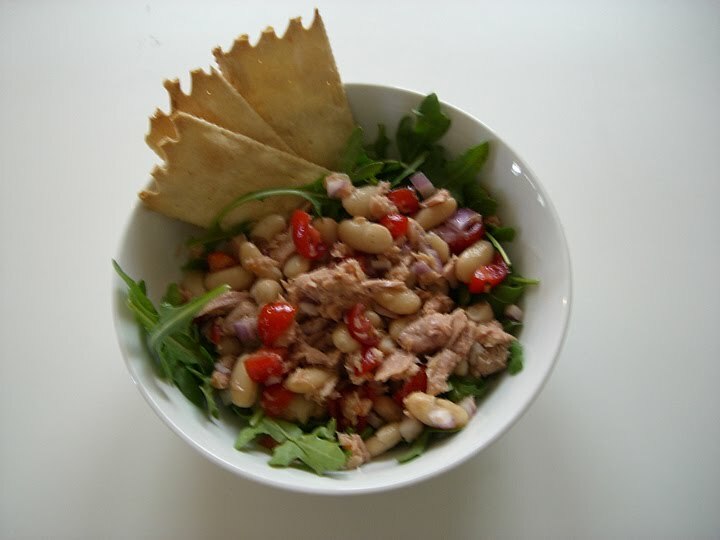 Break the tuna up a little with a fork, leaving it pretty chunky. Add drained and rinsed cannellini beans. 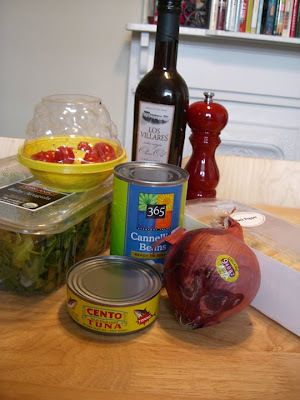 Add chopped tomato and onion. Mix lightly. Add salt and pepper to taste. Spoon over arugula in your serving dish or mix arugula in to the whole salad if you prefer. Add extra olive oil if you want it. Eat with nice crackers or crostinis if you have them. This serves hmm... about 3 people, I'd say. 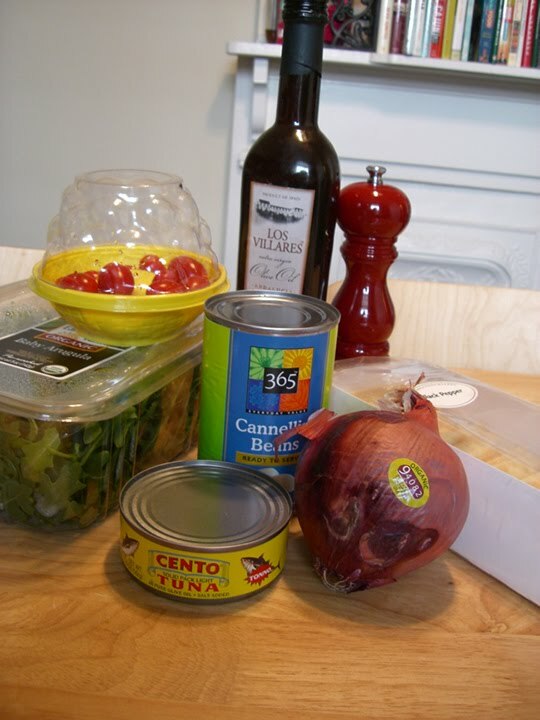 * If you absolutely can't find tuna in olive oil, buy tuna packed in water, drain it and then add your own good olive oil. Let it sit in the olive oil marinade for about an hour before you make your salad. I was visiting friends recently who had some very fine chickens and eggs from Soul Food Farm in Vacaville, CA. For dinner, they decided to make Thomas Keller's buttermilk fried chicken from the Ad Hoc cookbook which was entirely delicious. The next day, the remaining chicken parts were used for stock... but not like any stock I've ever made. This was done sloooow, over 5 or 6 hours, and at very low heat. 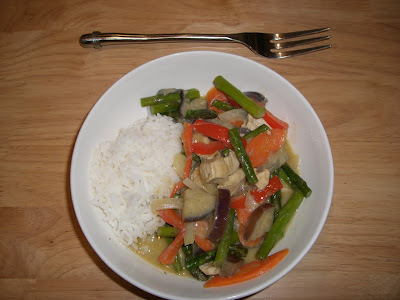 The result was an incredibly fragrant and intense stock that I knew I needed to do at home at first opportunity. I preheated the oven to 190 degrees. I know. Crazytalk. Using a small chicken from Whole Foods refrigerator case (sorry, I can't remember what kind it was), I removed the breasts, thighs and legs for another use. I rinsed the remaining parts and placed it in a 5 quart dutch oven, covered it with water and placed it in the oven. That's it. No salt, no pepper, no vegetables or aromatics... yet. Cook at this low heat for 4-5 hours. I pulled out the pot every hour or so to see if it needed skimming. There was very little to worry about. Keeping it below a boiling temperature doesn't seem to create much froth. When I pulled it out after the first hour, hardly anything had happened and I wondered if I had the whole thing wrong but after after 4-5 hours, what I had was an super rich, deeply fragrant stock that was ready for the next step. I added a carrot, broken in half, a head of garlic cut in half through the bulbs, the white part of a leek cut in half lengthwise, half of a yellow onion including the papery skins, a large pinch of salt, about a teaspoon of peppercorns, a bay leaf and a bundle of mixed herbs. Back in the oven it went for another hour to hour and a half. When I took it out for the final time, I had some froth that needed skimming but was too fine to catch with my skimmer so I ended up sending the final stock through a strainer with a paper towel inside it. The taste was phenomenal. I got maybe a third as much broth as I usually do from one chicken but it was so rich and delicious, I can't possibly complain. Now, you'd think that I'd have used it right away but I didn't. It's in my freezer (about 2 quarts) waiting for the chance to shine. I haven't decided yet what to make with it, but I'll let you know when I do. Have suggestions? The obvious choices are soup or risotto but I wonder if there is something more fun I'm not thinking of. Gumbo? It's been a little too long since my last post but in my defense, my camera is causing me major fits and is on it's last little camera leg, making it hard to document anything. I haven't been eating anything very interesting lately either. All I've really been up to is worrying about subground drainage, incredibly expensive plumbing repairs and the horrible, mysterious smell that seems to be coming from one of the AC vents in my house. Woe is the fledgling homeowner. 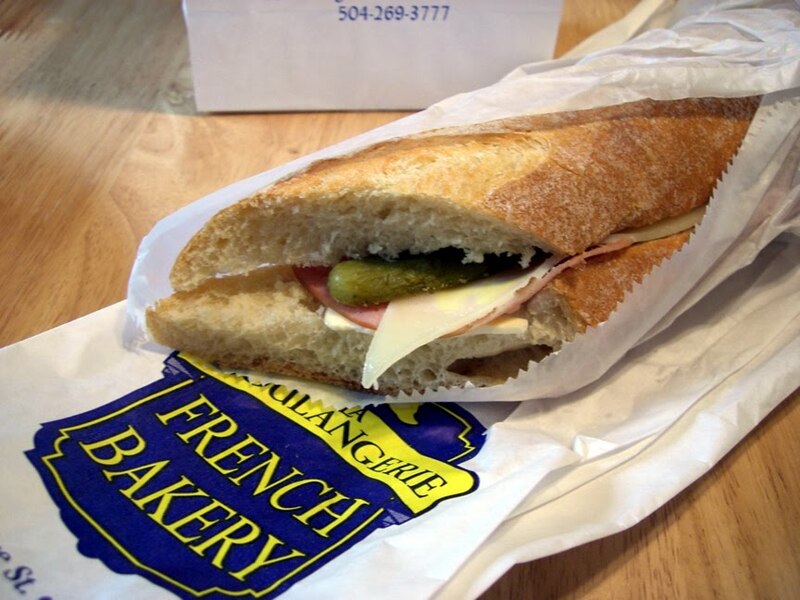 That said, I did pick up lunch today at one of my favorite spots in New Orleans, La Boulangerie on Magazine Street. I've been going here for hm... it must be 10 years now. They are wonderful. In addition to having (hands down) the best croissants, chocolate muffins (there's a proper French name for those that escapes me at the moment...), pastries and fresh baked breads in town, they offer a really fab lunch. Several types of sandwiches, small pizzas, quiche and soups are available. I tend to go with the sandwiches. They are simple with nice ingredients, cheap (less than $6) and generously portioned. I like that they are not overworked, just a really good, simple sandwich. My favorite is the ham, swiss, butter and pickle on crusty French baguette sandwich. Its crumbs are littering my keyboard as I type. Delicious. The butter and pickle really, really make the sandwich. Follow that up with a gorgeous fruit tart and I'm in heaven. This one is raspberry but they are all excellent and not too sweet. Exactly the way I like them. Impulsively, I bought a container of kumquats at Whole Foods last night. Other than being a tart little one-bite-wonder snack and excellent accompaniment for dark chocolate, I don't know what else to do with them. Seems like I should be able to incorporate them into a recipe of some sort... I like the idea of caramelizing them, maybe with greens or ... hm. I don't know. Ideas? Speaking of dark chocolate, I brought some home from San Francisco with me that's incredibly good. Poco Dolce is an S.F. based chocolatier who specializes in salted bittersweet chocolate tiles and toffee. 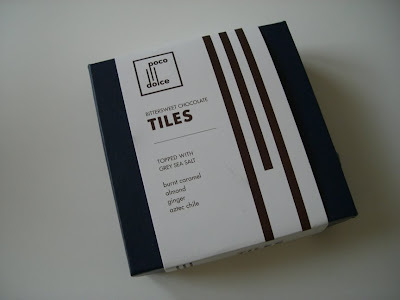 I have only ever had their chocolate tiles (I try to grab some every time I go there) and they are superb. My favorite is the assortment that includes burnt caramel toffee tiles, toasted almond tiles, crystallized ginger tiles and aztec chile tiles (cinnamon, 2 types of chiles and toasted pumpkin seeds) all topped with grey sea salt. They are incredibly delicious. 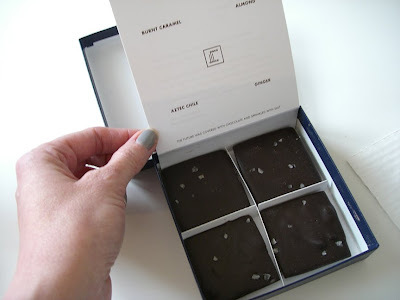 The chocolate alone is of excellent quality and the additions are perfectly balanced. Highly recommended. Plus, who can not love a company who tells you this? The future is covered with chocolate and sprinkled with salt. Now, that's a future I look forward to. I absolutely love raw oysters and will eat them at any opportunity. Casamento's on Magazine is my favorite spot for oysters for lunch (if I can make it there before their lunch hour ends at 2pm). It's a great, old place with gorgeous original tile work everywhere. Non-pretentious, but clean and welcoming. The service is warm and friendly. You can get serious advice about their excellent oyster-centric seafood menu. I went today with the intention of having a half dozen raw and then following it up with an oyster loaf. Unfortunately, I forgot they were cash only and only brought enough to have the half dozen (only $4.25!) and a side of fries. It was fine. I'm no oyster expert, but I do know that gulf oysters are different than any other oysters I've ever had. First of all, they're HUGE. Seriously, GIGANTIC oysters. Next, not nearly as briny as other varieties, sometimes hardly briny at all, as was the case today. Always sweet, plump, succulent... delicious. They're great for cooking and perfect for lightly dipping, whereas I think that would be a sin with some of the more delicate and flavorful oysters of the world and wouldn't dream of it. My dipping technique is to squeeze a slice of lemon in to the dipping dish, then add a nice pinch of horseradish and 2-3 drops of Louisiana hot sauce. Spear the oyster on fork, quickly dredge in sauce, eat oyster, moan with pleasure, repeat. 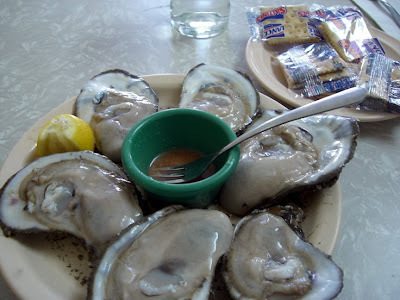 What are the oysters like in your neck of the woods and how do you like to eat them? Oh, Casamento's fries are great too. Crrrisp! I've spent the weekend in San Francisco and very fortunately for me, my hosts packed much foodie fun into my short visit. I ate amazing and lovely things at Incanto, so I'll have to come up with some manner of review for you. I didn't take any photos, but they are all still pretty fresh in my mind, so hopefully I can share the descriptions, at least. Teasers are: fried strips of pig ear, pork belly, pink peppercorn ice cream... More on that later. I have been shown how to make a chicken stock that cooks for about 6 hours on very low heat in the oven. I can't wait to try it. It smelled amazing. Oh, and at Kamei Restaurant Supply, I have purchased two new kitchen goodies: a Japanese benriner mandolin and a simple mortar and pestle. I am flying home tonight and will be trying to think of how best to put them to use when I get home. Any suggestions would be fabulous. If you had a shiny new mandolin, what would you make first?